“CDA: Meeloophooligans ook de klos” CDAer Çörüz legt uit in het massaochtendblad De Spits: “de minister moet bij het Openbaar Ministerie (OM) eisen dat ook de meelopers worden vervolgd (…) onder het motto ‘Je was erbij, je bent erbij’.” Het lijkt een aanpak met massa-arresaties zo overgenomen van kameraad Alexander Lukashenko uit Wit Rusland, nu nog vast te leggen in een nieuwe Voetbalwet, straks gemakkelijk van toepassing verklaart op de komende woelingen in Hollands winkelstraten en andere sociale onrust. Wie geeft er nog om het behoud van ‘de rechtsstaat‘? Misdrijven worden gepleegd door individuen en groepsgewijze aanrekening dient gebaseerd te zijn op bewijslast per individu. Met dit massa-arrest voorstel wordt niet de oorsprong van het probleem aangepakt, maar enkel de uitwassen. Frustrated (unemployed) youth educated as a consumptive generation without having the means? Lack of educational opportunities? Street gangs? Enraged youngsters fed up with discrimination? Spontaneous associations of troublemakers from all over town? 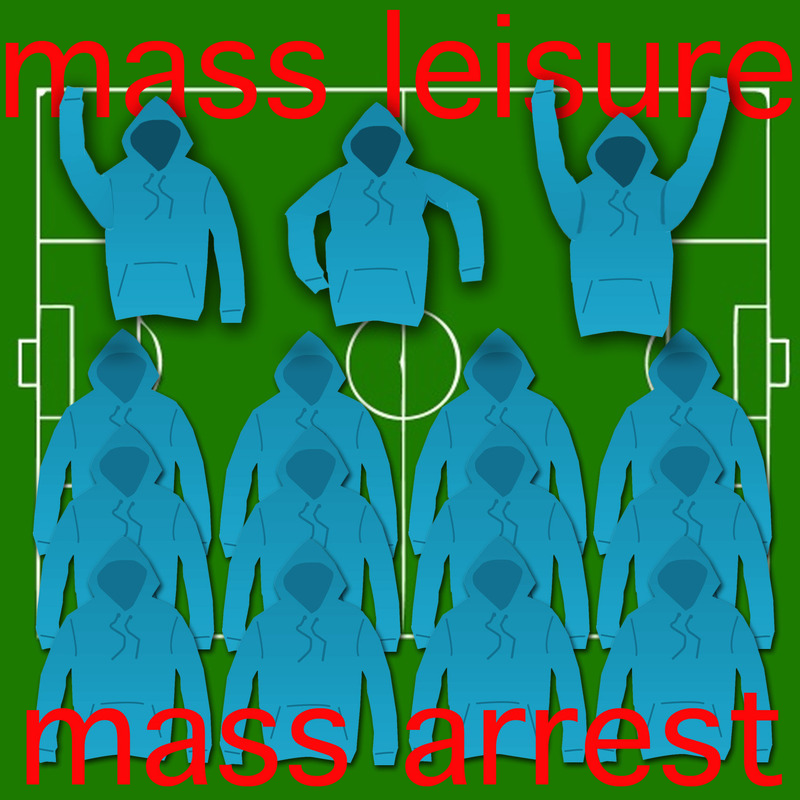 Combinations of window smashers and bystanders that (also) grab the opportunity of unpaid shopping? Many more options could be thought of. As we do see several examples of local shopkeepers and entrepreneurs, who are part of the local community, that fall victim to arson, smashing and looting, one wonders about the motivation and background of the perpetrators. Don’t be fooled by the name [“The Ledbury”, named after the street; Tj.] , which should belong to an unassuming gastropub. Nigel Platts-Martin and Philip Howard’s venture is a very serious restaurant. This is the kind of food that aims to draw a round of applause before it’s even been tasted, where sauces are poured in complex geometries, where slender towers of ingredients appear more like architects’ models than food, and where familiar-sounding ingredients have foamed, crushed and pureed beyond any hope of recognition. Before gentrification, this part of Notting Hill used to be known as ‘crack square’. The Ledbury has replaced this trade with food that’s better than any drug, but at prices that will bankrupt you faster than the most ferocious addiction. For the rest I can see very few examples of a possible low class versus high class rebellion. The old bastion of high class shopping Harrods – “Luxury beauty and fragrance, fashion accessories, gifts” – in Regent Street has – as far as I can ascertain – not been looted. Seeing the burnt out local shopping streets and hearing the fate of those who could flee in time their homes, those that had their shops or workplaces smashed, makes it hard to explain away the riots just on the wide class divide the UK always had and has not been able to level or soften. Social discontent finds its way of expression here in extreme a-social and life threatening deeds. The imagination of a possible future change of power relations seems mostly absent within the circle of rioters. It is all ‘here and now’. The classical pattern of first smashing goods and property in a furry and next trying to take possession of them, was present here. Goods that can be carried away changed owner, property that is unmovable was set on fire. A ‘jacquerie à l’anglaise’, spontaneous, violent and politically unconscious. An unstructured rise of the lower classes, fed by vengeance and want. Hitting around you and hurting your neighbour. The nearest by – half a step higher – class on the long British social ladder, singled out as target. Neighbourhood stores and community facilities fell victim first. The idea of some sort of minimal solidarity within a neighbourhood of similar social content, drowned by a single incident: “A young man shot at Warrington Road, Croydon junction with Dupass Hill” (the first line in the Guardian 2011 Riot database). A young man, of 27 years, named Mark Duggan, a father of four children, killed in Tottenham – North East London – by a police officer who halted and wanted to control him, who is said to have felt threatened, and fired. The subsequent confrontation with the police during a demonstration protesting this killing by a police man, ignited the smoldering discontent in this North London neighbourhood. The series of riots that sprang from there on, were mostly outside of Central London. One may recall the very different street violence when half a million protesters marched through Central London in March 2011 during the London Anti-Cuts Protest. At that time there were a few violent actions aside of the main peaceful demonstration, a phenomenon that can often been seen in the margin of any big demonstration. That violence was different from the August riots now. In March unruly more political oriented groups targeted ‘symbols of the capitalist system’, located in the West End of London. 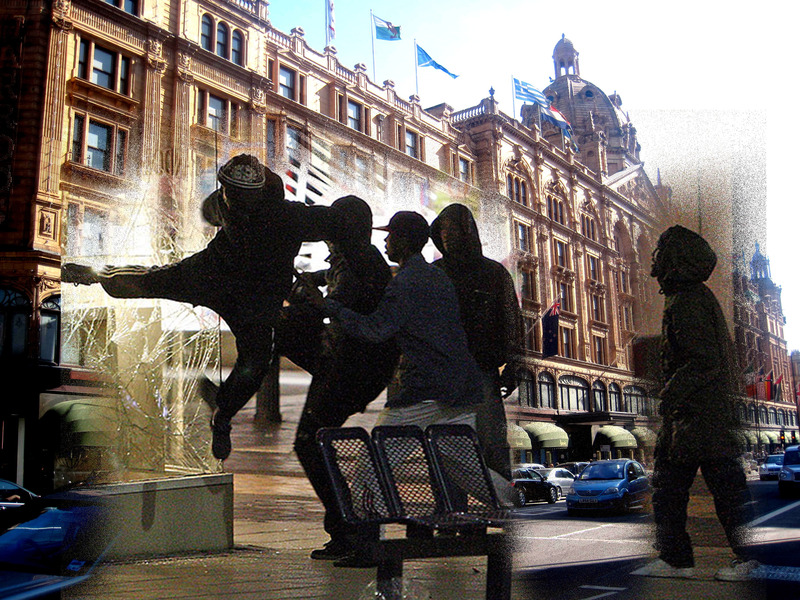 Window panes in Oxfords street were smashed, Banks graffitied , the Ritz Hotel hurled with firework and a bonfire was started in the heart of the London shopping district at Oxford Circus. 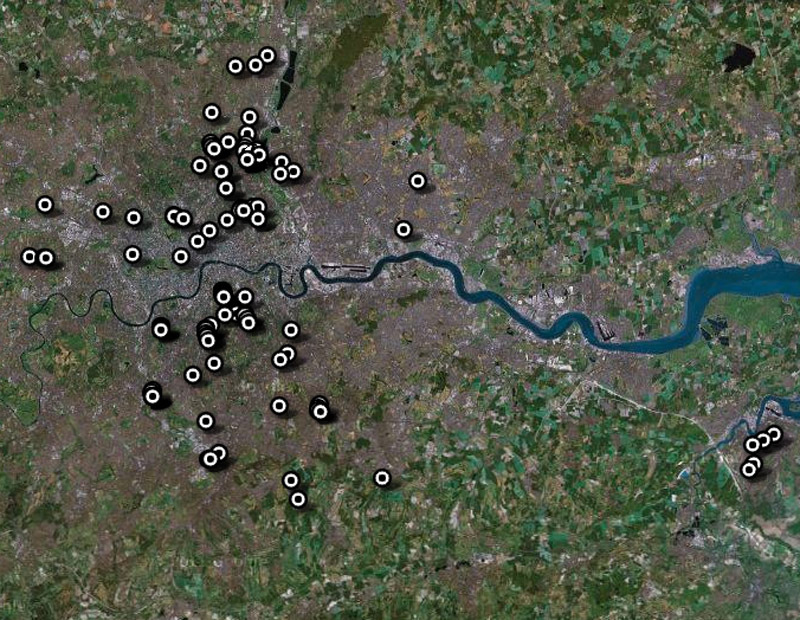 Overview zoom from interactive GoogleMap on the 2011 summer riots by The Guardian as published 9. August 2011; the central parts of London are hardly effected. The list of London’s low class riot shopping as can be curled from The Guardian’s UK Riot Locations database, is less spectacular than what the tourist board of London promises to affluent tourists from abroad. It is the regular high street shop chains with sport shoes, cheap clothing, mobile phones, house electronics and the like that were favoured by the looters. The class-devide reigns so strong in the UK that the imagination of revolting youth did not even led them venture in the more classy central districts where the luxurious shops and high end brands of London can be found. It is very similar to what in the year 2005 could be observed during the suburban risings in France and especially the ones around the centre – the banlieu – of Paris. The violence was – at that time – confined to the suburbs proper. No window smashing or car burning at the most exclusive shopping areas of Paris at Place de Vendôme or Saint Sulpice. 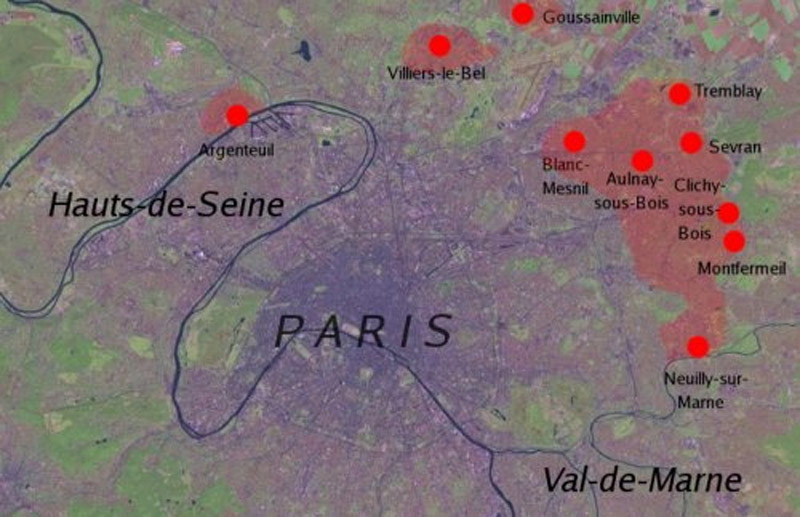 Map of suburban riots around Paris in November 2005 as published by Wikipedia. The inner town of Paris is not effected by the lower class risings and car burning. The Guardian map of all the incidents shows that it was not only suburban low income areas, where the looting takes place. There have been some examples of ‘high street’s with shops in more affluent areas, like for example in the City of Westminster near St. John’s Wood. But in general it is the poorer areas that are most effected. Stripping the data in alphabetical order, here is my first raw list of ‘places’ which are often shops where incidents took place. The number of occurrences with the same place name are indicated by my small script. Now there are not so many shops that have been targeted more than once, let me list them first.